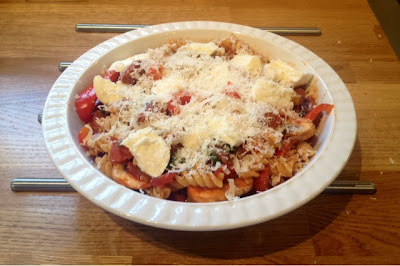 This is a great recipe for satisfying a family full of hungry bellies, who doesn’t love cheesy, tomatoey pasta goodness with smokey meaty chunks thrown in. 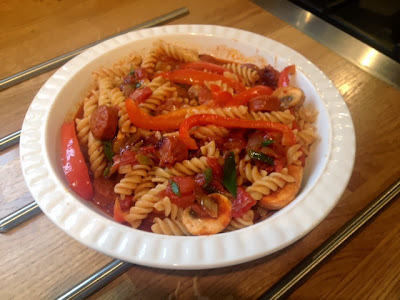 This is a great one for feeding the family as it’s made from a lot of ingredients you would probably usually have in the cupboards/refrigerator anyway. 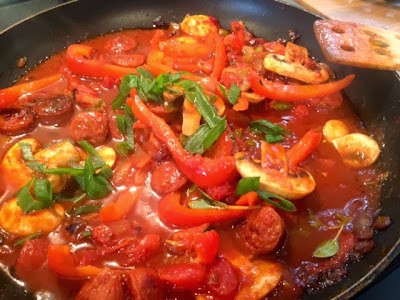 I’ve used chorizo sausage which I buy quite regularly but if you don’t and you don’t want to go and buy it specially then substitute for any old sausages that you’d usually get, it just won’t have quite the same rich smokey flavour. 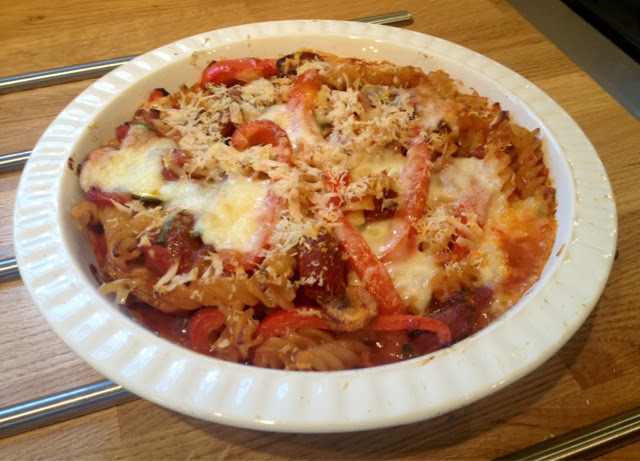 The dish has a nice heat to it but won’t blow your head off and is mild enough for kids. This recipe feeds four. 1. Preheat the oven to 180°C. 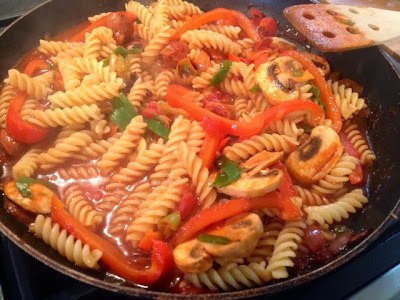 Put the pasta on to boil and keep an eye on it while you get on with the sauce. 2. On a medium heat fry the chorizo, red onion and the white end of the spring onion, reserve the green leafy bits for later. 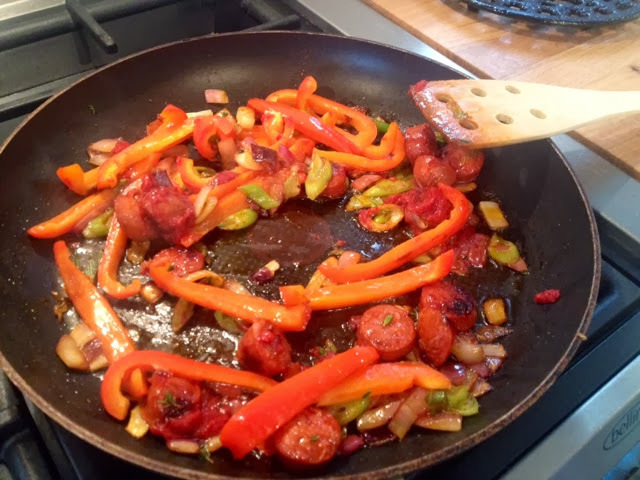 The chorizo should release quite a lot of oil so only add a little extra if it’s not releasing enough and the pan is too dry. Fry until onions are beginning to soften. 3. Add the peppers, tomato purée and leaves from the thyme and continue to fry gently for 3-5 mins, peppers should have softened a little. 4. 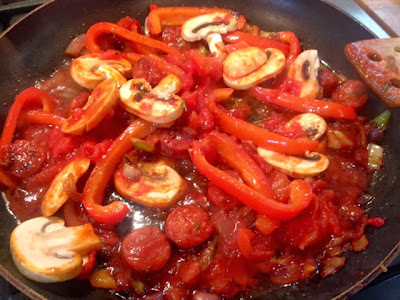 Add the chopped tomatoes, the mushrooms and the spices. Simmer gently for 5 minutes. Meanwhile check on the pasta, drain if cooked and reserve a little of the water (roughly 1/2 cup), it helps the sauce stick to the pasta. 5. 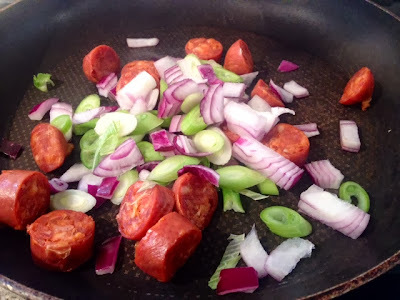 Add the basil and the green leafy bits from the spring onions. Stir through. 6. Pour the pasta and reserved water into the sauce and mix thoroughly to ensure all the sauce/veg/chorizo is spread evenly throughout. 7. Pour the whole mixture into an ovenproof baking dish. 8. Tear the mozzarella into chunks and place evenly across the top, then cover with a generous topping of grated Parmesan. 9. Bake in the oven for 20 mins until cheese is melted and top has turned golden. 10. 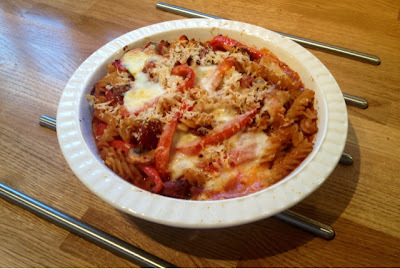 Remove from the oven and serve to a hungry family!